Exercise machines come in many shapes, sizes and forms, and they are designed to work every part of the body. When slim thighs are your goal, you need to focus your attention on cardiovascular exercise. This is performed in a repetitive motion for an extended period of time. Sitting on a leg press or leg extension machine and cranking out a bunch of reps to lose weight in the thighs is inviting. Unfortunately, the idea that you can lose weight in a specific area is mistaken, according to the American Council on Exercise. This is known in the fitness industry as spot reduction. To truly create slimmer thighs, you need to use a cardiovascular machine. Picking the best one for you depends on your personal interests. A good start is to choose one that involves movement of your thighs. Treadmills, elliptical trainers, exercise bikes and rowers are examples. With the exception of a treadmill, these are also low-impact machines. The thighs contain two major muscles known as the quadriceps and hamstrings. The quads are on the front and the hamstrings are on the back. Your goal with a cardio machine is to engage both of these muscles in a continuous manner. Take an exercise bike, for example. Every time you extend your knee and move your thigh upward, you work your quads. When you flex your knee, you work your hamstrings. This causes you to burn calories and tone your muscles, which will give your thighs a leaner appearance. Regardless of the cardio machine you choose, you need to exercise consistently and regularly to get positive results. According to the American College of Sports Medicine's exercise guidelines, it can take more than 60 minutes of activity performed five days a week to achieve weight loss. Start your workouts with a light warm-up, then increase your pace to a point that you are breathing heavily and sweating. Remain at this pace for the rest of your workout. If you do not have time to fit in a long exercise session, work out more than once a day. 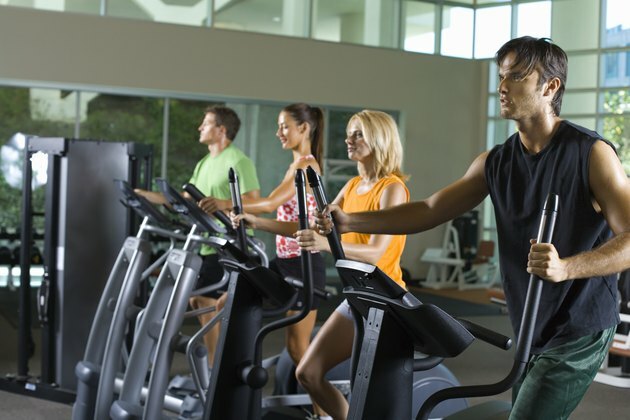 Cardio machines give you several features to choose from. A treadmill for example, has speed and incline features. By incorporating these into your workouts, you can perform intervals and boost your caloric expenditure. Begin by walking briskly for five to 10 minutes to warm up. Then, increase the speed or incline and run for 20 seconds. Reduce the speed or incline for 40 seconds and continue to bounce back and forth for the rest of your workout. Using an exercise machine is only part of the solution when it comes to obtaining slim thighs. You also have to take your diet into consideration. If you perpetually eat cheese fries, sausages and meatball hoagies, you will defeat your exercise efforts. Follow a diet that is high in nutrient-dense foods and low in saturated fat, sugar and sodium. To further promote weight loss, cut back on your daily calories. Does the Elliptical or Treadmill Slim Down the Thighs?